Living like you might die tomorrow starts with having a life to live, and life starts with clean water. Those of us who don’t have to worry about having our basic needs of food, water, and shelter covered have the mental capacity to consider what we want to do with our life. People who don’t have access to clean water spend an inordinate quantity of their time and energy every day securing often below standard water quality. Death of children and adults from drinking dirty water is grossly common. When you have to spend that much time and energy securing water and often getting sick from it, you simply don’t have much left to contemplate what you want to do with your life or how to die without regret — your focus is simply on surviving. I have been involved with charities and nonprofit organizations for many years, and I have carefully considered which would be the first organization for YOU MIGHT DIE TOMORROW to support. I considered suicide outreach, experiences for individuals with terminal illness, early childhood education, and more. But everything starts with clean water. Water gives life, it’s healing, soothing, cleansing, and it inspires awe — these same elements which make for a good life. YOU MIGHT DIE TOMORROW stands for really living life before you die. Let’s give this chance to people all around the world. On behalf of YOU MIGHT DIE TOMORROW, I have joined charity: water’s The Spring, a passionate and determined group of monthly givers on a mission to end the water crisis in our lifetime. YOU MIGHT DIE TOMORROW has pledged a monthly donation and will give 5% of all proceeds to give people clean water and a chance to think about more fulfilling things in life than whether they or their children will die from taking a drink. Want to support giving clean water to people in need yourself? 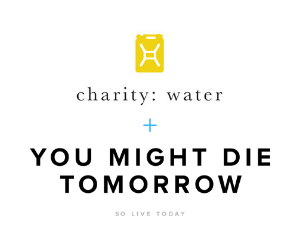 Consider making a purchase in the YOU MIGHT DIE TOMORROW shop or donate to charity: water directly.